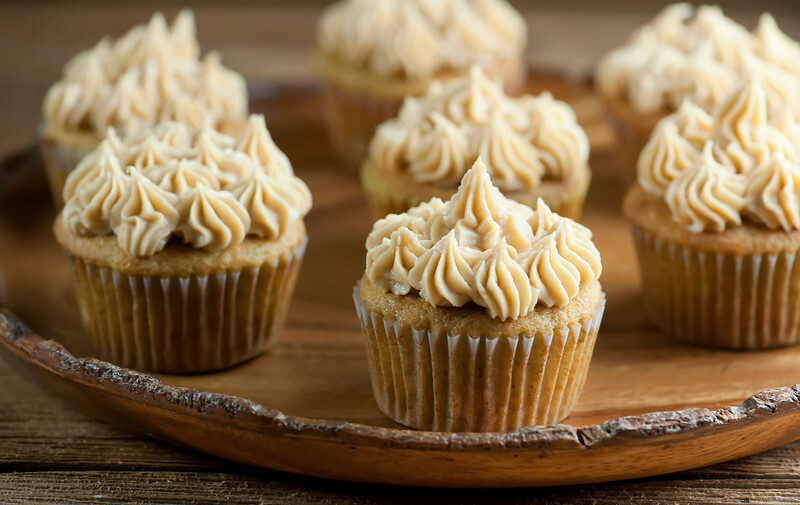 This fun recipe for banana cupcakes with peanut butter frosting takes two favorite flavors and puts them together in one delicious dessert! Oh, and it’s a great way to use up leftover bananas. I do love baking with bananas, and sometimes despite knowing that there is a cornucopia of banana-baking possibilities out there I sometimes find myself dealing with aged bananas by making banana bread on repeat. But the world is full of banana options, and one of my favorites is combining two of my very favorite flavors: banana (obviously) and peanut butter. 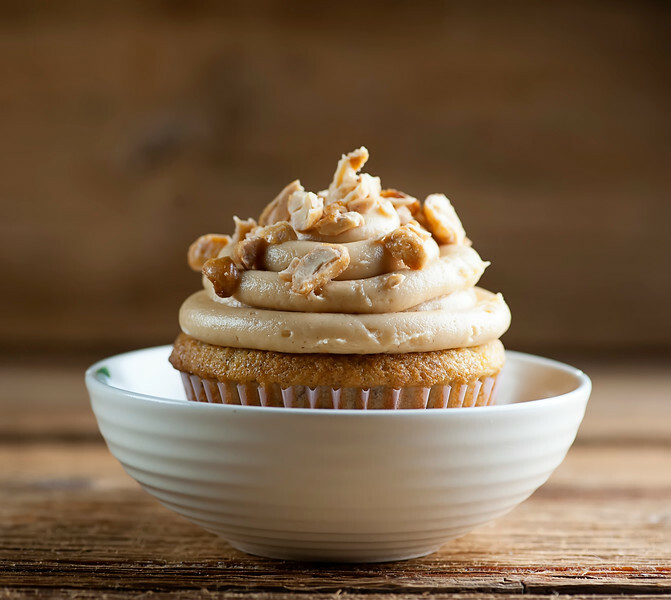 Imagine if you will a cupcake of tender banana wonderfulness, topped with a creamy, dreamy, peanut butter frosting. Two great tastes that taste great together – let’s make them! These three are not ripe enough, but since they are more handsome than the Extremely Ripe version you need, I figured you could use your imagination. You are going to smoosh them up into a lovely light dough and bake them up in a muffin tin. Cool them off completely and then whip up the easy peanut buttery frosting. The frosting job that I did on the cupcakes involved a pastry bag and some decorating tips that the Southern husband got me for Christmas, which all sounds very fancy and complicated, but it’s as easy as easy can be. But feel free to slather that frosting on there however you want. It’s going to taste AWESOME no matter what it looks like. If you want to go the full peanut route, you can also sprinkle some chopped peanuts on top for extra pizzazz. One way or the other, here’s to over-ripe bananas! Preheat to 350° and line a 12 cup muffin tin with paper liners. Put flour, baking powder, baking soda, and salt in a mixing bowl and stir with a whisk to mix it all up thoroughly. Get out the frustrations of the day by mashing the bananas with fork or a potato masher in a separate bowl. Stir sour cream and vanilla into bananas. Beat the sugar and butter until light and fluffy, about 3 minutes. Add egg and egg yolk and beat until well blended. Add flour mixture alternately with banana-sour cream mixture, beginning and ending with flour mixture. Divide batter among muffin cups. Bake cupcakes until toothpick inserted into center of each comes out clean, about 20 minutes. Transfer cupcakes to rack and let cool completely. Now for the frosting! Sift the confectioners sugar into a large bowl. Add cream cheese, butter, and peanut butter and beat everything together until it is nice and smooth. You can either spread the frosting over the top of the cupcakes with a knife, or have fun with your favorite frosting/piping bag. Sprinkle some chopped peanuts on top if you like, and stand back and watch those cupcakes go! OK, they have bananas in Buenos Aires ! yay! Finding peanut butter might be hard to impossible but .. what about Nutella? Definitely give Nutella a try – I think it would be great! love these! I am always looking for different ways with bananas too and have some bananas going really ripe right now! My husband loves bananas and peanut butter. A great idea to combine them. He will love the cupcakes…but mostly the frosting, I think. It's Elvis in cupcake form :) I'm with you on the browning bananas. Although half the time I let them go to waste because my banana bread never turns out. I'm not sure why. I'm starting to think it's because I overfill the pan. That is a nice change from banana bred – your cupcakes look beautiful! These look so fabulous! I always liked spreading peanut butter on banana bread….so this looks right up my alley. Yum! I made these this week and they were delicious! I added to the recipe by sprinkling mini-chocolate chips on top. Great Recipe! I just used your recipe (minus the frosting) and put in some orange zest, So YUM! Thank You!! these are so freakin' good. i could mainline the frosting. i made them for a benefit auction and they were a HUGE hit. the woman that ended up with them said they were some of the best cupcakes she had ever tasted. I garnished with a dried banana and some crushed honey roasted peanuts. yum! I just made these for a school bake sale, and the banana cake part truly is amazing. I made chocolate cupcakes from a box and then these. It is unbelievable how much difference you can taste between the box cupcakes and the ones made from scratch. The flavor is incredible, and the texture is so moist! I have never tried bananas in my cupcakes. I thought this is going to be a very nice idea! Thanks a lot for sharing. I love the frosting. It is really nice. I love peanut butter a lot. I think this will also do good on chocolate cupcakes. Thanks for the recipe!! I am going to make these today!! I, too, have very ripe bananas sitting on my counter!! I love your blog. I can’t believe I just found these cupcakes. I can’t wait to try them.